Do your team meetings to discuss what/how/when to build XYZ new hot thing feel a little too much like a session of the United Nations Security Council? Wouldn’t it be nice if you had those headsets that translated designspeak to devspeak and vice versa? 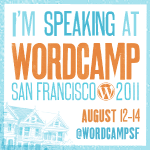 I’ll be speaking at WordCampSF this Saturday, Aug 13th about communication strategies that will improve your team relationships and help you have more productive conversations. Hot damn! I was on the homepage of slideshare for a minute! View more presentations from Crystal Beasley.